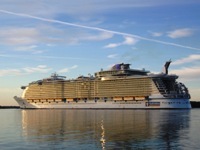 Oasis of the Seas is currently the largest cruise ship in the world. She belongs to the world's second-largest cruise line operator Royal Caribbean International, a Norwegian / American cruise line brand based in Miami, Florida. The giant ship was built in the shipyard of STX Europe (formerly Aker Yards), in Turku, Finland, and is now serving in the Caribbean region. Her sister ship Allure of the Seas are expected to be delivered in December 2010.
started maiden voyage on 5 December 2009, calling at (8 December) St. Thomas, (9 December) St. Maarten, and (11 December) Nassau. The website oasisoftheseas.com provides us with many fun facts about this beautiful giant cruise ship. Oasis has a deck 4.5 giving AquaTheater entertainers and divers access to the depths of AquaTheater during performances.